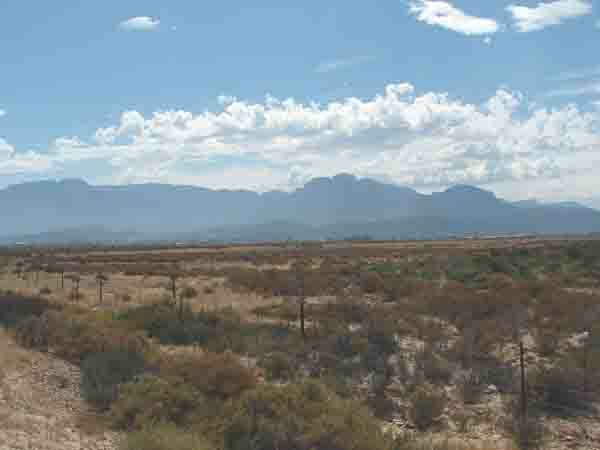 Worcester is located in the Breede River valley about a 120 kilometres to the north east of Cape Town. To reach the town one can travel over the spectacular Du Toits Kloof Pass where the road winds its way up the west side of the du Toits Kloof mountain range. This route provides spectacular views over Paarl and Wellington before reaching the crest. Once over the top it winds its way through the mountain to where it joins the N1 again on the eastern side of the tunnel. The mountain pass was one of the main highways to the north but was exceptionally dangerous especially with large trucks and bad weather during the winter months. Much time was wasted as one often had to creep down the pass behind one of these large trucks. People attempting to overtake them on the narrow road often came to grief when they met oncoming cars. The authorities then built the Huguenot tunnel through the mountain range and cut off 18 kilometres of mountain pass. The route is much safer now although one has to pay a toll to use the tunnel. Once on the eastern side of the tunnel the road, which has been upgraded to a double carriage way winds its way through the tall mountain peaks before reaching the Breede river valley . The Breede is one of the longer SA rivers and winds its way through the countryside until it reaches the sea at Witsands on the Cape's south coast. It is navigable for about 30 kilometres inland from its mouth. Worcester is known as the capital of the Breede River Valley and is at the centre of the Breede river wine route. There are many wine estates in the area and you can visit some of them as you approach the town. They produce some very good wines so if you love the fruit of the vine this is the place to visit. Worcester is to wine what the Swartland is to wheat. Its the largest wine producing area in SA. Up in the hills on the approach to the town is the Goudini Spa where you can hire bungalows and swim in the natural warm water that flows out of the mountain. Worcester although an important business centre has retained its rural town atmosphere. There are large open spaces and wide roads which are not found too often these days. The main street and some side streets still have some old Cape Dutch buildings dating back to the 1800's. 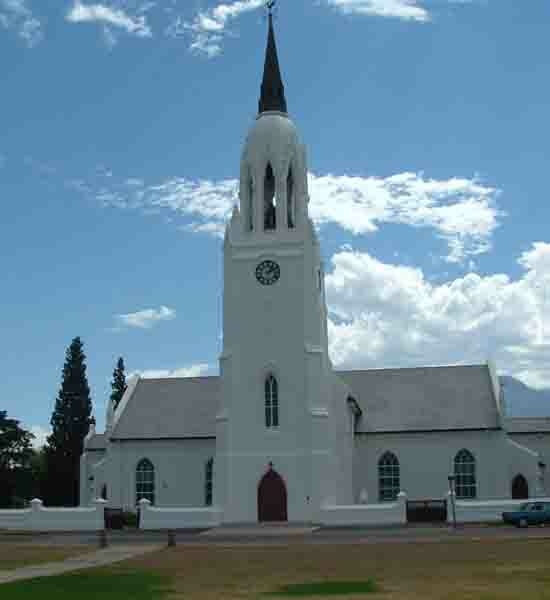 The Dutch Reformed church with its large steeple is a good example of the older buildings that are still found in the town. The town is also the home of the Worcester School for the Blind. To assist pupils the traffic lights in the town have whistles which shrill when its safe for them to cross the main roads. The traffic lights are enough to drive a motorist mad if you are not used to them. Klein Plasie (Small Farm) is another place of interest. This little farm is a permanent display in the local show grounds. Its a working farm a dating back to the late 1800s where people live as the trekkers of old did. The farmers mill their own wheat and bake bread in ovens heated by fires. The farmhouse has all the mod cons you would have found in a house at that time. Everything made by hand by the farmer and his helpers. They still make their own candles from sheep fat and distill their own WitBlits . (White Lightning or white brandy, a powerful drink that is about 100% proof alcohol). The local distillers still manufacture it today. To drink it one must have the constitution of a horse as it contains a kick of a mule and the firepower of a dragon. All in all Klein Plasie is a very interesting place to visit. You can purchase some of the products produced on the farm. On the outskirts of the town there is a large dam used for drinking water and for cultivation of the vineyards. Its large enough to sail small yachts and windsurfers on. As the town gets very hot in summer with temperatures reaching into the 40's at times its good to have a dam you can swim in. Surrounding towns are Ceres and Villiersdorp to the north and south where apples and pears are produced. To the east is Robertson, Montague and Ashton where the sweeter wines are produced and where the main fruit canneries are to be found. To really enjoy this area a few days should be spent visiting all the places of interest and tasting the various wines produced. You will be amazed at the variety of tastes you will find.